Have you ever needed an extra place to hang towels when company is over. 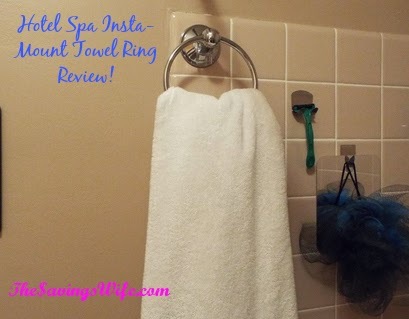 Check out this review for the HotelSpa® AquaCare series Insta-mount Towel Ring. With 4 kids and 2 adults we are always in the shower. That means we need places to hang our towels to cut down on the amount of laundry we do in a week. About Hotel Spa Insta-Mount Towel Ring! Easy to mount on all smooth or textured surfaces not tools required. Includes a 90 degree Push-Lock design for gripping power. Can be re-positioned instantly at any time. Made of Stainless steel with a high-polish chrome finish. Maximum weight capacity for the ring is 10 lbs. The Insta-Mount Towel Ring is super easy to install. With simple directions! It can be hung and removed on any smooth surface. I used mine on my shower tiles. I even tried to hang from the towel ring and would be more likely to pull off the tile than the ring while it is suctioned on. It is definitely strong enough for those super sized bath towels. When your done with the ring it is easy to remove. It would work great for small bathrooms so you can attach a towel holder to the mirror. For rough or Textured surfaces it comes with an Adhesive Disk to place on your wall to mount the towel ring. It also comes with a 5 year limited warranty.